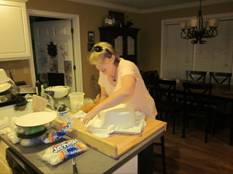 Gwen Winder works on one of her cake decorating projects. Q: What is your position with the College and how long have you worked here? A: I have been an administrative support associate in the Dean’s office since being hired full-time in mid-August. Prior to that, I had worked in the same position as a STEPS employee since mid-May. 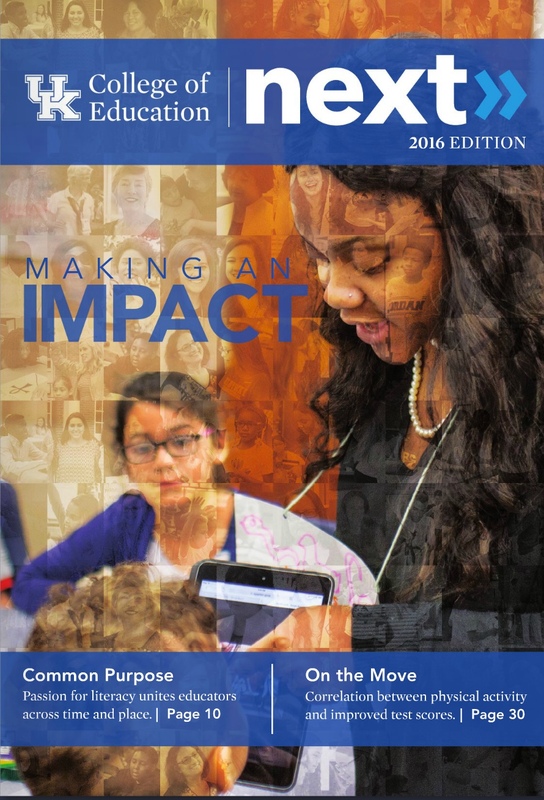 I was an assistant to [former UK College of Education] Deans John Harris and Shirley Raines from 1995 to 1997. Q: What did you do between your times here? A: I worked at home doing medical transcription for 14 years while raising my sons, Philip and Charlie. Q: What do you like most about working at the College? A: I love the people, being able to take classes, and being able to park so close to where I work (haha). A: I love to read, watch movies, garden, shop, and about 18 months ago I began decorating cakes with my friend, Janelle Chapman. This dragon cake took Gwen and her friend 20 hours to decorate. Q: How did you get into decorating cakes? A: Janelle has been decorating cakes for her children and friends for years. We first worked together to make a birthday cake for a mutual friend. We had so much fun that we started making cakes for family and friends. Janelle had never used fondant in decorating because of the chemical taste of commercial fondant, but online I found a recipe using marshmallows that’s really easy and the kids love it. Q: What is it about decorating cakes that you enjoy so much? A: I enjoy having a creative outlet and we have so much fun working together, but my favorite thing is seeing the expressions on the faces of those who receive one of our cakes. 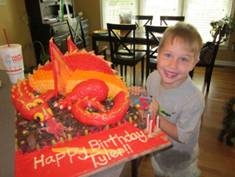 We’ve put as much as 20 hours into making and decorating a dragon cake. Q: What was your favorite one? 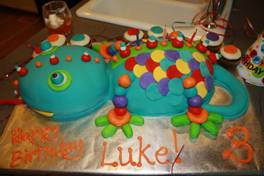 A: My favorite cake wasn’t the hardest to decorate, but we made a gecko cake for Janelle’s 3-year-old, Luke. We found a photo online weeks before his birthday and he named the gecko “Mr. Sticky,” but he pronounced it Mr. Ticky. Whenever I was at their house, Luke would ask if I was there to make Mr. Ticky. When he finally saw Mr. Sticky, he was so happy.